After a fight with her siblings, Vesta-Linnéa hides at her favourite place by the sea. It’s a sunny summer’s day but Vesta-Linnéa’s thoughts are dark. She feels unloved and less important than the other children in the family. She is not the oldest and not the baby. Not even mum cares about her, she knows it! 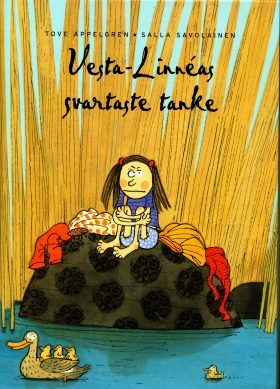 The fourth book about Vesta-Linnéa beautifully handles the subject of feeling alone and unloved. Perfectly describing the child’s emotions but also how the feelings turn and all is well again, in the end.